This is a story of fullness and hunger. Of too much and too little all at once. What follows is a straight transcription of the spoken narrative of this video. Please watch for the full effect and find additional information including undercover footage of foie gras suppliers in the afterward. A gnawing at my core. Starting small and subtle. Easily ignored. Until it grows, becoming ever-more urgent. A need. A wanting. A gaping chasm demanding fulfillment. Hunger. A sensation I know only in theory. I long to be empty. I hunger for hunger itself. I’m trying to rest before the light comes. The light and the fullness that follows. The fullness that, unlike the light, never leaves. It’s getting harder to move. Harder to breathe. Some of my brothers have given up. I can’t turn to see them. I know only by the absence of their breathing. Amazing what’s conveyed by a void. Death is the only emptiness we know. I try to think back to the brand new time. Before the sound of my own breathing drowned out the world. Have I ever known hunger? Or was I born full? Was there a time before the bars and wires? Before I had to listen for my brothers instead of look? Did we ever long for food? Did we ever feel desire for anything but nothingness? The light comes. And they come. The Fillers. It’s too soon. I hear my brother’s heavy exhale as they grab his neck. And then the humming. It happens so fast. Too fast. Always too fast. It’s almost my turn already. The Filler reaches next to me and grabs my breathless brother. He’s tossed into a can with the other breathless ones. Empty of breath but still full. And then the grabbing, the hum, the force—tearing into me. Cold and burning at the same time. How can I possibly hold more? Forcing food on top of food on top of food. My breath leaves me to make space and I think of my brothers in the can. And then it’s over. It’s dark again. What’s left of my breath returns. I try to drink the air but there’s no room for it anymore. It’s hot and quick. Fire in my raw throat. I hear my brothers trying too. Trying to fill ourselves with air. All around us but impossible to have. Perhaps we do know hunger, after all. The light is back. And they are back. It’s too soon. I wait for the hum but something’s different. I hear the groaning of bars. The squeaking of wires. I hear my brothers’ muted cry. Not even enough air to scream. And then it’s my turn. The grabbing again, but no hum. The groans. The squeaking, and I’m free from the lock down. My wings extend, fire tears through them. The Fillers throw me into more wire. This time with my brothers beside me. Breathing. Heavy and quick. And then moving. I’d forgotten moving. And light—real light! I’d forgotten light. And air that’s cool. If only I had room. We’ve stopped moving. Some of us have stopped breathing. There’s more groaning and squeaking. I can’t see but I know they’re coming. The Fillers. They’re coming to fill us again and tear the last bit of breath from us. The grabbing again. This time it’s my feet. The fire’s in my feet and I’m upside down. It runs down my legs past my core so heavy and out through my mouth. I think I’m tearing in two. My body too full for my legs. My wings are beating. I’d forgotten my wings. How did I forget a part of me? How did I forget—my breath! I’ve got no breath! I feel the air from my brothers’ wings. All of us making air. All of us needing air. And then I see them. The Fillers. And it's too soon. I have no room left. I have no air left. I have too much and not enough all at once. And then the air from my brother before me stops. Then the grabbing. But this time no hum. Just fire. Shiny and hot. 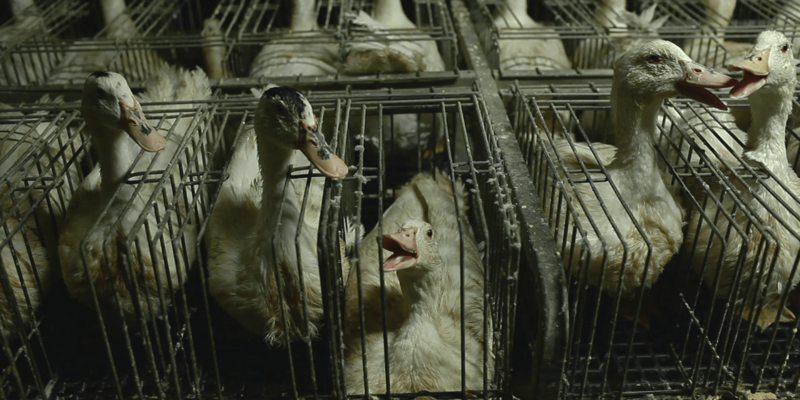 This is the story of a duck force-fed and slaughtered for the so-called “delicacy” foie gras. This is not an isolated incident. For more information on the foie gras industry, please see the information and additional videos below. Foie gras, French for “fat liver,” is regarded as a gourmet delicacy. But for the ducks and geese in the foie gras industry, who are force-fed 2-3 times a day via metal tubes jammed down their throats, shooting high-carbohydrate mush into their stomachs, the process is anything but delicate. 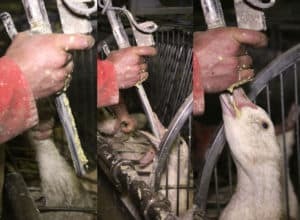 The brutal practice of force-feeding, known as gavage, begins when the birds are between 8 and 15 weeks old and lasts anywhere from 10-21 days. During the “feeding period,” they are either kept in “barren cages,” single-bird enclosures virtually flush against each bird’s body or in filthy, overcrowded group pens deceptively referred to as “free-range” facilities. 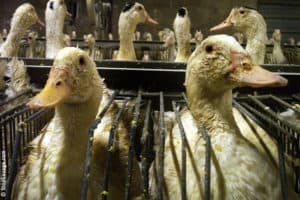 See the lie of “Humane Foie Gras” exposed in this video, which compares Amazon.com’s “free-range” foie gras supplier Hudson Valley’s public image and private reality. You can also get more information on the corresponding blog post. 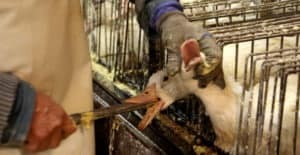 Ducks raised for foie gras are typically slaughtered at 100 days of age, and geese at 112 days, with the mortality rate of foie gras birds prior to slaughter reaching upwards of 20 times greater than birds raised without force-feeding. Foie gras is considered so barbaric that it’s been outlawed in many countries including Austria, the Czech Republic, Denmark, Finland, Germany, India, Israel, Italy, Luxembourg, the Netherlands, Norway, Poland, South Africa, Sweden, Switzerland, and the U.K. Additionally, foie gras imports & sales are banned in India. Retailers like Target, Safeway, Costco, Giant Eagle and Wolfgang Puck have also banned foie gras. In late 2004, then governor Arnold Schwarzenegger signed a bill banning the sale of foie gras in California. The ban took effect eight years later in July 2012, but was overturned only 2.5 years later on January 7th, 2015. Duck-farming organizations sued over the ban and even when in place, it was not respected in restaurants. The short lives of birds raised for foie gras are absolutely brutal. They are denied even the most fundamental pleasure so central to their nature: swimming in water. They live in constant pain, imprisoned in their own bodies as much as their cages. Now go live vegan, take brutality off of your plate, and I’ll see you soon. Report of the Scientific Committee on Animal Health and Animal Welfare, “Welfare Aspects of the Production of Foie Gras in Ducks and Geese” (Scientific Committee on Animal Health and Animal Welfare, December 16, 1998). Patricia L. Brown, “Foie Gras Fracas – Haute Cuisine Meets The Duck Liberators – NYTimes.com,” accessed June 3, 2016. Comite Interprofessionnel des Palmipedes a Foie Gras, “The Fattening Phase,” accessed June 3, 2016. Viva!, “Torture in a tin: Viva! foie-gras fact sheet,” Text, Viva!, (July 21, 2015). “Ducks Crammed Inside Cages for Foie Gras,” PETA, accessed June 3, 2016. PETA (People for the Ethical Treatment of Animals), Ducks Cruelly Caged for Foie Gras, 2013. PETA (People for the Ethical Treatment of Animals), Kate Winslet Exposes Foie Gras Cruelty, 2015. Emily Moran Barwick, “Amazon.com Foie Gras: Expectation Vs Reality,” BiteSizeVegan.com, April 4, 2016. Compassion Over Killing | www.cok.net, “Hudson Valley Foie Gras Factory Farm Investigation,” Compassion Over Killing, accessed June 3, 2016. The Humane Society of the United States, “Scientists and Experts on Force-Feeding for Foie Gras Production and Duck and Goose Welfare,” accessed April 3, 2016. “What the Experts Say about Foie Gras | StopForceFeeding.com,” accessed April 4, 2016. E. Fournier et al., “Relationships between Storage and Secretion of Hepatic Lipids in Two Breeds of Geese with Different Susceptibility to Liver Steatosis,” Poultry Science 76, no. 4 (April 1997): 599–607. Hannah Healy, “Meet the Meat That’s BANNED in Some Countries,” January 9, 2015. Mercy For Animals, “Video: Shocking Animal Cruelty Exposed at Amazon Foie Gras Supplier,” AmazonCruetly.com, accessed March 10, 2016. Christopher Zara, “Amazon Urged To Ban Foie Gras: Animal-Rights Group Calls Retailer A Lame Duck Over Controversial Food,” International Business Times, June 12, 2013. Rachel Tepper, “California Foie Gras Ban Kicks In,” The Huffington Post, accessed March 10, 2016. Matt Williams, “California Takes Foie Gras off the Menu, but Some Chefs Say Ban Is a Bit Rich,” The Guardian, June 30, 2012, sec. Life and style. Stacy Finz and Paolo Lucchesi, “Foie Gras Ban Triggers California Lawsuit,” SFGate, July 3, 2012. Kurtis Alexander and Paolo Lucchesi, “California Foie Gras Ban Struck down by Judge, Delighting Chefs.,” SFGate, January 7, 2015. “California’s Foie Gras Ban Overturned,” The Huffington Post, accessed April 3, 2016. Bob Egelko, “Animal Rights Groups Can Sue Napa Restaurant over Foie Gras,” SFGate, accessed April 3, 2016. Emily Moran Barwick, “The Extremism Of Veganism | Exposing The Greatest Lie,” BiteSizeVegan.com, accessed May 18, 2016. Emily Moran Barwick, “All About Eggs,” BiteSizeVegan.com, accessed June 4, 2016. Steven L Leary and American Veterinary Medical Association, AVMA Guidelines for the Euthanasia of Animals: 2013 Edition, 2013. The Council of the European Union, “COUNCIL REGULATION (EC) No 1099/2009 on the Protection of Animals at the Time of Killin,” Urnal of the Europ, September 24, 2009. Emily Moran Barwick, “Europe’s Dark Secret: Eye Opening Speech!,” BiteSizeVegan.com, accessed June 4, 2016. Ian Hughes, “Live Ducklings ‘Thrown in Mincer’ in Shocking Animal Rights Video,” Mirror, October 20, 2014. Barwick, Emily Moran. “All About Eggs.” BiteSizeVegan.com. Accessed June 4, 2016. http://bitesizevegan.org/tag/all-about-eggs/. ———. “Amazon.com Foie Gras: Expectation Vs Reality.” BiteSizeVegan.com, April 4, 2016. http://bitesizevegan.org/ethics-and-morality/amazon-com-foie-gras-expectation-vs-reality/. ———. “Europe’s Dark Secret: Eye Opening Speech!” BiteSizeVegan.com. Accessed June 4, 2016. http://bitesizevegan.org/ethics-and-morality/europes-dark-secret-eye-opening-speech/. Brown, Patricia L. “Foie Gras Fracas – Haute Cuisine Meets The Duck Liberators – NYTimes.com.” Accessed June 3, 2016. http://www.nytimes.com/2003/09/24/dining/foie-gras-fracas-haute-cuisine-meets-the-duck-liberators.html?pagewanted=all. Comite Interprofessionnel des Palmipedes a Foie Gras. “Phases of Foie Gras Production.” Accessed June 3, 2016. http://foiegras-factsandtruth.com/breeding/the-breeding-phase. ———. “The Fattening Phase.” Accessed June 3, 2016. http://foiegras-factsandtruth.com/fattening/the-fattening-phase. Finn, Peter. “To Hungarian Professor, What’s Good for the Goose Is Good for the Goose Liver Industry.” Washington Post Foreign Service, January 31, 2000. Fournier, E., R. Peresson, G. Guy, and D. Hermier. “Relationships between Storage and Secretion of Hepatic Lipids in Two Breeds of Geese with Different Susceptibility to Liver Steatosis.” Poultry Science 76, no. 4 (April 1997): 599–607. GourmetCruelty.com. “The Truth about Foie Gras.” GourmetCruelty.com. Accessed June 3, 2016. http://www.gourmetcruelty.com/. Hughes, Ian. “Live Ducklings ‘Thrown in Mincer’ in Shocking Animal Rights Video.” Mirror, October 20, 2014. http://www.mirror.co.uk/news/world-news/shocking-video-shows-hundreds-live-4468027. Newkirk, Ingrid. “5 Big Fat Lies About Fatty Liver (Foie Gras).” The Huffington Post, 46:14 500. http://www.huffingtonpost.com/ingrid-newkirk/5-big-fat-lies-about-fatt_b_6482104.html. PETA. “Ducks Crammed Inside Cages for Foie Gras.” PETA. Accessed June 3, 2016. http://www.peta.org/features/ducks-crammed-inside-cages-foie-gras/. ———. “The Pain Behind Foie Gras.” PETA. Accessed June 3, 2016. http://www.peta.org/issues/animals-used-for-food/animals-used-food-factsheets/pain-behind-foie-gras/. PETA (People for the Ethical Treatment of Animals). Ducks Cruelly Caged for Foie Gras, 2013. https://www.youtube.com/watch?v=ajuxfGgoYuA. ———. Ducks Cruelly Force-Fed for Foie Gras, 2013. https://www.youtube.com/watch?v=uW2uiw-p_js. ———. Kate Winslet Exposes Foie Gras Cruelty, 2015. https://www.youtube.com/watch?v=DyOu-GVtgPQ. Polis, Carey. “Hudson Valley Foie Gras Website Hacked By Animal Rights Activist.” Accessed March 10, 2016. http://www.huffingtonpost.com/2013/04/26/hudson-valley-foie-gras-hacked_n_3162704.html. Report of the Scientific Committee on Animal Health and Animal Welfare. “Welfare Aspects of the Production of Foie Gras in Ducks and Geese.” Scientific Committee on Animal Health and Animal Welfare, December 16, 1998. http://www.wakkerdier.nl/uploads/media_items/ec-rapport-foiegras.original.pdf. Satran, Joe. “California’s Foie Gras Ban Overturned.” The Huffington Post. Accessed April 3, 2016. http://www.huffingtonpost.com/2015/01/07/california-foie-gras-ban_n_6432738.html. Skippon, Warren. “The Animal Health and Welfare Consequences of Foie Gras Production.” The Canadian Veterinary Journal 54, no. 4 (April 2013): 403–4. “StopForceFeeding.com.” Accessed June 3, 2016. http://www.stopforcefeeding.com/. StopForceFeeding.com. “What the Experts Say about Foie Gras.” StopForceFeeding.com. Accessed April 4, 2016. http://www.stopforcefeeding.com/content/what-experts-say-about-foie-gras. The Council of the European Union. “COUNCIL REGULATION (EC) No 1099/2009 on the Protection of Animals at the Time of Killin.” Urnal of the Europ, September 24, 2009. http://eur-lex.europa.eu/LexUriServ/LexUriServ.do?uri=OJ:L:2009:303:0001:0030:EN:PDF. tryveg. COK Goes Undercover Inside Hudson Valley Foie Gras, 2008. https://www.youtube.com/watch?time_continue=35&v=XNJDZm1bgVA. ———. COK Goes Undercover Inside Hudson Valley Foie Gras, 2008. https://www.youtube.com/watch?time_continue=35&v=XNJDZm1bgVA. Viva! “Torture in a tin: Viva! foie-gras fact sheet.” Text. Viva!, July 21, 2015. http://www.viva.org.uk/resources/campaign-materials/fact-sheets/torture-tin-viva-foie-gras-fact-sheet. www.cok.net, Compassion Over Killing |. “Hudson Valley Foie Gras Factory Farm Investigation.” Compassion Over Killing. Accessed June 3, 2016. http://cok.net/inv/hudson-valley/. Such a disgusting practice and humans think this is a delicacy. I applaud the countries that banned this cruelty. What is wrong with the United States not banning it. Arnold Schwarzenegger was wonderful to ban it, unfortunately cold hearted people reversed it.